Mumbai: Filmmaker Boney Kapoor plans to launch Bollywood's biggest blockbusters of 2018, Badhaai Ho South Indian remake only after the completion of his Nerkonda Paarvai, starring Ajith Kumar. Kapoor has acquired the rights to remake the Junglee Pictures’ production in Tamil, Telugu, Malayalam and Kannada. Kapoor is returning to South film industry after a gap of 25 years with Ajith Kumar's Tamil film Nerkonda Paarvai, has acquired the South Indian remake rights of Ayushmann Khurrana's Badhaai Ho. Badhaai Ho revolves around a 25-year-old Delhi boy played by Ayushmann, who learns that a second sibling is on the way. Neena Gupta and Gajraj Rao play the parents grappling with this shock pregnancy with Sanya Malhotra playing Ayushmann’s lady love and Surekha Sikri as his sharp-tongued grandmother. Confirming the news Kapoor said to a daily, “It's a film that resonates with both the masses and classes so I was keen on remaking it. The Hindi version has done extremely well in the heartland, in fact, across the country, and I am confident the reception down South will be as overwhelming. I am yet to decide whether the Tamil or the Telugu version go on the floors first as it's work in progress," Pune Mirror quotes him as saying. 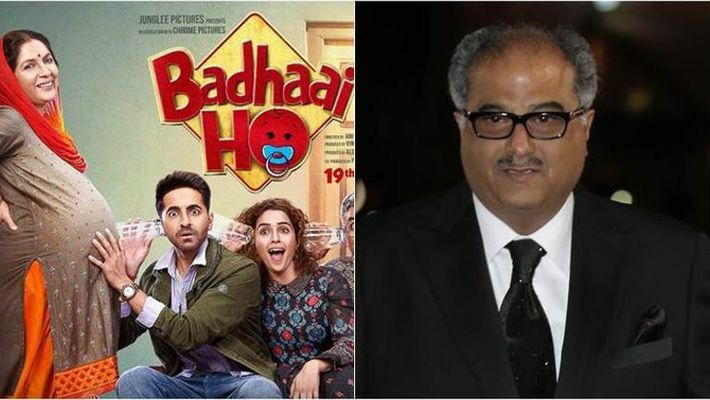 According to Boney Kapoor, the content of Badhaai Ho has the potential to connect with the South audience. Kapoor had earlier produced South movies like Raatri and Antham in Telugu. Coming to his latest film Ajith-starrer Nerkonda Paarvai, the shooting of the film is currently happening, and it is expected to be out in August.